Long Live the King was one of Caldwell’s original lines. It sports a Dominican Corojo wrapper and binder, along with filler tobaccos from Nicaragua (Habana Ligero) and Peru (Pelo de Oro). It is marketed as a full-bodied, small-batch cigar made from grade-A tobaccos. Two years later, in 2016, Caldwell released an offshoot of Long Live the King called Savages. This limited-edition line is said to be “creamier and nuttier” than its predecessor. It employs a Habano wrapper, Dominican binder, and filler tobaccos from Nicaragua and the Dominican Republic. There are five Savages vitolas, each packaged in 10-count boxes: Corona Larga (8 x 45), Piramide (6 x 50), Super Rothschild (4.75 x 52), Toro (6 x 54), and Corona Extra (6 x 46). The latter retails for about $11. It makes a strong first impression with a flattened pigtail cap, pre-light notes of sweet hay and earth, and interesting double bands of cream, gold, and silver (Caldwell deserves credit for its marketing and graphics). The oily exterior leaf has thin veins and a chameleon-like color that seems to change in the light from light brown to reddish to dark brown. The Corona Extra is consistently dense from head to foot. Consequently, the cold draw has a bit more resistance than I would like. It isn’t, however, what I would call tight. Once an even light is established, the draw opens almost instantly. What follows is a bready, medium-bodied profile of white pepper, cocoa powder, oak, and soft cayenne heat. There’s also a damp mustiness that reminds me of cigars from Davidoff or PG. Around the midway point, the draw opens once again. Here, it’s virtually effortless and the smoke production is voluminous. The result is a taste that’s simultaneously more intense and creamier. Individual flavors include peanut and coffee with milk and sugar. The damp mustiness—a note that’s more delicious than it looks on paper—remains a central feature until the end. The final third is decidedly more chocolaty, however. 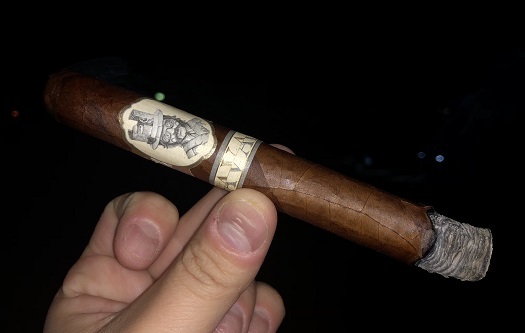 Throughout, the physical properties include a solid ash and a burn line that, while imperfect, does not seriously hinder the enjoyment of the wonderful flavors. A couple torch touch-ups are enough to keep things on track. Perhaps the defining characteristic of the Savages Corona Extra is its rich, balanced complexity—as well as the density of the oily smoke, and the damp, earthy, mushroom-like mustiness. This is, by far, the best cigar I’ve had from Caldwell. It’s worthy of an excellent rating of four and a half stogies out of five.